Can Design Science Research Bridge Computer Human Interaction and Information Systems? The initial view of the Information System (IS) community was to consider IS as an “applied” discipline borrowing theories and methods from more mature “reference disciplines”. 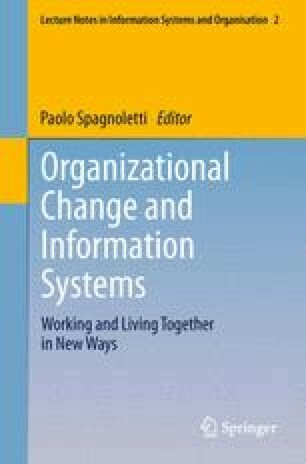 As ISs shifted from a techno-centric focus to a more balanced view of technology, organizational, management, and social focus, traditional reference disciplines proved to be poor models for emergent goals of IS studies, and the IS field began to pose itself as independent of them. A further shift was advocated in 2002 by Baskerville and Myers who suggested that IS was mature enough to start to create a bidirectional flow of knowledge with other fields. Though this view has been recently challenged by some empirical studies, in this Chapter we contribute to this intellectual discourse through a conceptual analysis of links between the IS and the HCI body of knowledge. In particular we discuss about a possible role of Design Science Research as a cultural and methodological bridge between the two disciplines. ACM SIGCHI (1996). Special interest group on human-computer interaction curriculum development group, Technical Report, http://old.sigchi.org/cdg/. Grudin, J. (2005). Three faces of human-computer interaction. Ieee Annals of the History of Computing, 27, 46–62. IEEE educational activities department. doi: 10.1109/MAHC.2005.67.